Shipping container house plans show in visual terms how your used shipping container home will look like after completion. The good news is . . . this Nigeria used shipping container home portal provides some great shipping container home plans for potential home buyers. We do more than just provide container house plans for potential buyers. 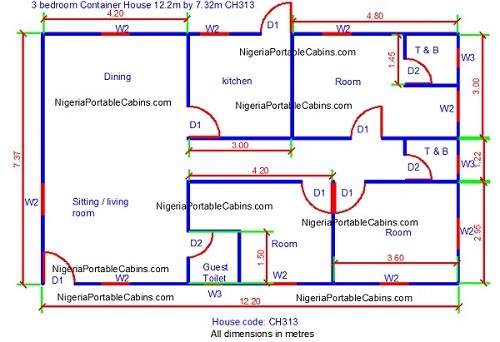 We are actually Nigeria's number 1 shipping container home construction company. We are in the business of converting used shipping containers into liveable residential homes for customers. NOTE: Scroll to the bottom of this page and fill the order form to request a quote for your own custom built container home. For example, a single 40ft used shipping container can be converted into a simple 1 bedroom bungalow. It can also be converted into a 2 bedroom bungalow. 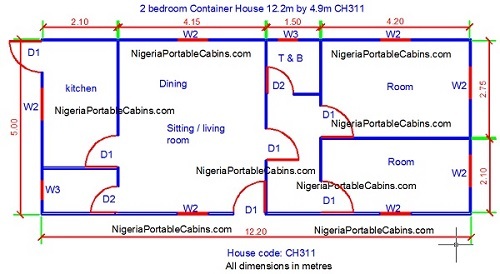 The building layout plans below (CH212 & CH214) shows the two container home building plan scenario mentioned above and how much space is available for the occupants. If you're someone who like a lot of space, then a single 40ft used shipping container should only be converted to a 1 bedroom container home and nothing more. What if you need more space? We simply combine as many units of used shipping containers that are required to create the amount of space you need in your new shipping container house. The popular accommodation types in Nigeria are . . .
As mentioned above, 1 unit of 40ft used shipping container will be sufficient to create a comfortable 1 bedroom bungalow. It can also be used to create a 2 bedroom bungalow (e.g. CH214 container home model; see building plan above) BUT the bedrooms will be smaller. What if you want a larger 2 bedroom container bungalow or 3 bedroom container bungalow? We simply create the larger 2 bedroom bungalow with 2 units of 40ft used shipping containers and the 3 bedrooms bungalow with 3 units of 40ft used shipping containers. Below is the shipping container house plans for our 2 bedrooms and 3 bedrooms bungalows mentioned above (CH311 and CH313 respectively). We are experts in converting used shipping containers into residential container homes and container offices. Want to buy a container home? Simply fill the order form below and we will respond with a quote.